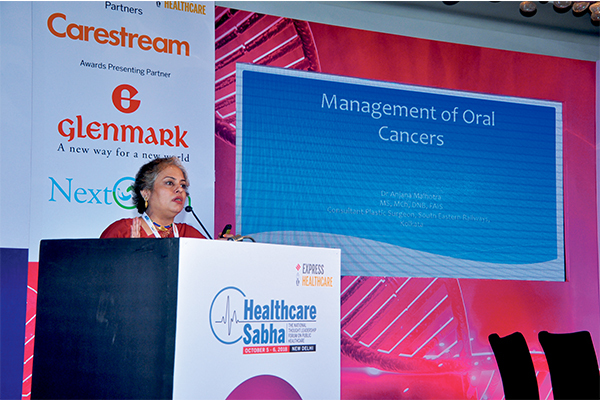 Anjana Malhotra, Additional Chief Health Director (plastic surgery) and Chief of Plastic Surgery Services at Central Hospital, South Eastern Railway, presented a case study on the burden of oral cancer, at the second day of Healthcare Sabha. “Tobacco is the leading cause of cancer and the railways is committed to curb cancer in India. We have started a new programme for detection and treatment of cancer,” she said. Soon after Malhotra’s presentation, a case study on retired employees health scheme was presented by Dr Bhudev Sengupta, Additional Chief Health Director, South Eastern Railway. Healthcare Sabha 2018 | Power discussion: Why quality matters?